Women's Original Back Adjustable Rain Boots is rated 4.5 out of 5 by 651. Rated 5 out of 5 by KarlaYG7 from Loove! Bought these a few weeks ago & I've used a few times in rain & snow. Love them so cute go well with outfits! Worth all the hype! Rated 1 out of 5 by kfbjbutler from Defective material I purchased these a little over a year ago for a gift, I was visiting and noticed the boots were discolored all down the front of both boots. I asked how long they had been like that and was told a few months after she started wearing them. I tried to clean them off with soap & water and it would not come off. It is in the material itself. Rated 5 out of 5 by Miss8604 from Obsessed!! Love the color even though it’s a tiny bit more gray than I expected bc they looked lilac online. Love the fit. So comfy!! Rated 5 out of 5 by Kayo from Perfect fit! 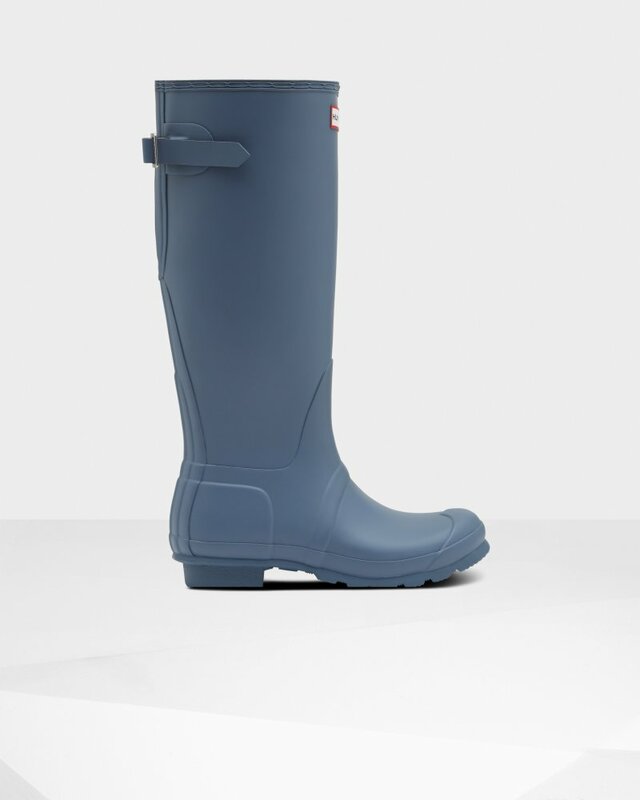 I’ve had many rain boots, and hunter boots are the best quality around. I’ve had my other pair for over a year, haven’t had any issues, and have plenty of compliments! Rated 5 out of 5 by WFisher from Classic Comfort These boots are comfortable and they seem very durable. I am very happy that I bought the adjustable back because I have large calves so I always seem to have trouble with rain boots but these have extra room around my calves. I also love the color (Thundercloud), the perfect grayish-purple. Rated 5 out of 5 by mescobedo07 from Love the Adjustable Strap I have big calves for as short as I am. I’m only 5’3 and they are 15 inches. I got a size up just because I knew on the 7 the strap would only extend 15 inches. The 8 fit perfectly gives me a little more room plus I can wear thick socks! Rated 5 out of 5 by Wasp from great I bought the original, non adjustable, for my wife. They were too tight for her calves. If you do not have twigs for calves, I highly recommend getting the adjustable pair. I had to return my original. I was highly satisfied with Hunter's return process. A little slow to get the refund, but it came without me having to question it. I was highly satisifed.